In Situ Art Society is a relatively new organization which was founded by Pavel Borodin and Georges Tampanidis (a.k.a. Georges Paul) in Bonn in 2014. Borodin shot the Concert for Fukushima film in Wels 2001, Paul is a bassist and saxophonist who has worked with Paul Lovens and various musicians in the Cologne free jazz scene. They mainly organize improv gigs and new classical music concerts as well as art exhibitions (e.g. one by Peter Gannushkin), screenings and lectures. The gigs usually take place at the Dialograum (German for dialogue space) Kreuzung an St. Helena, a big, beautiful venue which is perfect for this kind of music and especially for the best sax/drums duo on the scene at the moment. 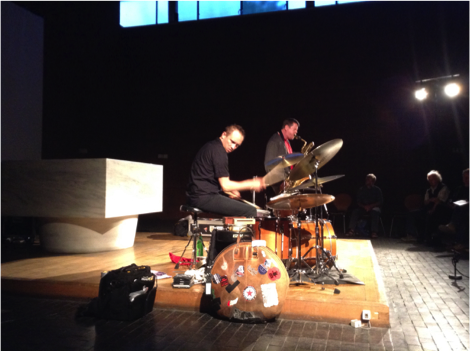 Although they had to travel a long way from a concert in Latvia the day before Ken Vandermark and Paal Nilssen-Love were in a good mood that evening. While Nilsson-Love trudged onto the bandstand in his typical way, Vandermark entered it light-footed - which was good news since he seemed to have problems with his leg on the last Made To Break tour in fall 2015. The two have an enormous musical vocabulary available, from classic free jazz runs, almost catchy hardbop riffs and funk/rock beats to intimate counterpoints and super-low dynamics. Like their albums their sets are structured by Vandermark’s choice of reeds: on clarinet he tries to explore the sound possibilities of the instrument and the room, the atmosphere of theses pieces is more introspective, they are quieter and slower and Nilssen-Love supports this by using extended materials like wooden sticks and blocks, little gongs, and mallets. On baritone and especially on tenor the two move up two gears. Vandermark literally hurls his phrases into the face of the listeners, he uses call-and-response riffs in which the lines in the deep registers are answered by passages in the high ones. He sputters the notes out like machine gun fire and Nilssen-Love is the concentrated berserker everybody loves. It’s like a competition who can push the other one harder. That night one could recognize fragments of their latest (and excellent) album The Lions Have Eaten One Of The Guards, and in the second set, the two even increased their usual dynamics. Nilssen-Love sometimes interrupted the high-speed character of the saxophone parts by interspersing dense rock beats that forced Vandermark to react, which he usually did with varied forceful and monotonous funky riffs. In his very recommendable book A Listener’s Guide to Free Improvisation, John Corbett ascribes Vandermark "a narrative, storytelling quality, as if, out of the abstract bramble, there was a tale yearning to be spun. Vandermark’s pretty masterful at peddling the story and managing not to assume a controlling position". Ideas were batted back and forth, it was a masterful dialogue in the Dialograum. At the end of the concert I looked at my friend Klaus, who is a newcomer to the world of free improv, and he just said: “Superb.“ That’s what it was. Following Vandermark on social media is a joy. Corbett seems to be on point. Vandermark: "I tend to look at improvising as way to respond to musical "problems" and "solve" them in real time- how do you move from one set of statements (as a band or as a soloist) to another and have them make narrative sense?" Vandermark has been touring like a madman with Nate Wooley, Nilssen-Love, Lean Left and Made to Break. I'm expecting some great music for us unfortunate souls who can't catch him & his tour partners live.